Let me begin by assuring you that there is nothing wrong with my record player. Also there is no problem with the record itself; it is not one of those slightly oval pressings, or one with a hump. This is how it is supposed to sound. Listening to this record by Moussa Doumbia can be an unsettling experience, though. With its unsteady pace, its weirdly mind-piercing organ, its unexpected breaks this 1980 album, released on the Ivorian Sacodis label, is not suitable for listeners with a nervous disposition. And listening to it while in a state of inebriation can lead to long lasting mental problems. Even the three songs which were recently (well alright, not recently - it was nearly three years ago...) included in the CD on the Oriki label, sound different on vinyl. Of course, in the present-day craving for Afro-funk Moussa Doumbia's music will be labelled as 'funk'. And I am sure he has - like many African artists - been influenced by the Fela Kutis and James Browns of this world. But nevertheless this native from Mali has retained a high level of originality, and arguably even authenticity. Despite the embellishment Doumbia's singing in the opening track "Houphouet Boigny" is in a relatively normal djeli (or griot) style. And if you listen closely "Samba" is actually the same song as "Samba" by Pivi et les Balladins from Guinea. And "Mokholou" a tune from the broad repertoire of hunters' songs from the Wassoulou, made famous by the great Toumani Koné. But it does not explain the beginning of "Disco Time". Dear worldservice there's nothing wrong with the record,except this:The "weirdly mind-piercing organ"in the beginning must be, if I recall it's sound well,one of the first cheap casios(or any casio sounding imitation)from the beginning of the 80's;also the poor preset casio rhythms are mixed with the real rhythm section and of course the result is totally asynchronous!Love it though,its like " djelis playing with toys"-thank you for your effort,the stories and the great music. Thank you!!! Thanks so much for posting this gem, absolutely brilliant. Shame this music is so hard to come by. WOW! I'm really looking forward to this! 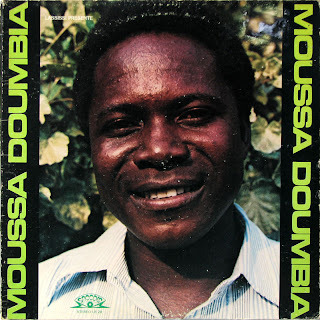 Doumbia's Yeye Mousso was pretty much my introduction to African music, from some long lost Antilles sampler. Mind shattering. A quarter century later, I expect my head will be broken yet again. THANKS! @reservatory: "some long lost Antilles sampler"? Asweome! Thanks for your periodical catering to the not-so-purist fans of your blog. I know you don't like the "afrofunk" label, and you're probably right, but I definitely love a lot of the music that - rightly or not - is thrown into that category. Thanks again!! It almost sounds as though the engineer spliced a short sound check of the orchestra at the start of Disco Time. I say almost, because my guess is just that. I have no idea what's going on with it, but the whole album is (as others have noted) great fun. Baaie dankie meneer dis mos a lekker gevaarlike nommer!